Many believe that cockroaches are only attracted to households that are messy and unkempt; however, this is a common misconception. These insects are also attracted to a home that may provide warmth during the winter months. To prevent an infestation from occurring as the cold rolls in this year, you must eliminate those things that roaches require for survival. These include a food source, a water source, and a shelter that is warm and will protect them from the environmental elements. Throughout this guide, you will be provided with a few simple strategies that will aid in keeping these creepy critters from invading your home when the outdoor temperatures begin to drop. Cockroaches have the unique ability to squeeze in through the absolute smallest of all openings. One of the best methods of preventing a winter infestation is to seal your home as tightly as possible. You should start by sealing the gaps located around the piping that runs into your home with a caulking that has a high level of flexibility. If there are cracks and/or visible crevices anywhere around or in the home, you should completely patch these areas. Any gaps that are present in your flooring, your ceiling, your walls, and around electrical cables should be sealed off and/or repaired immediately. By sealing your home and making it as tight as possible, you will be eliminating the insect’s ability to squeeze through and make your home their home. 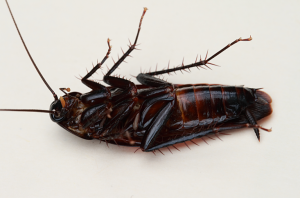 The next step to preventing a cockroach infestation during the cold months is to ensure that you eliminate any and all water sources. A roach only needs a small amount of water for survival. While it is important to tackle the big water sources, you should also pay attention to the small water sources, too. First, seal off the bathtubs with a plug. If you have a standalone shower, you should cover the drain. You should also check to ensure that you have no plumbing leaks in or around your home. Do not leave water standing in bathtubs or sinks. You should also close the lids to toilets and avoid leaving water containers for pets out. When you wipe off counters, be sure to dry them, as well. Also, when putting away dishes, be certain that they are thoroughly dry.